Look familiar? This row of Victorian houses is one of the most photographed scenes in the city. 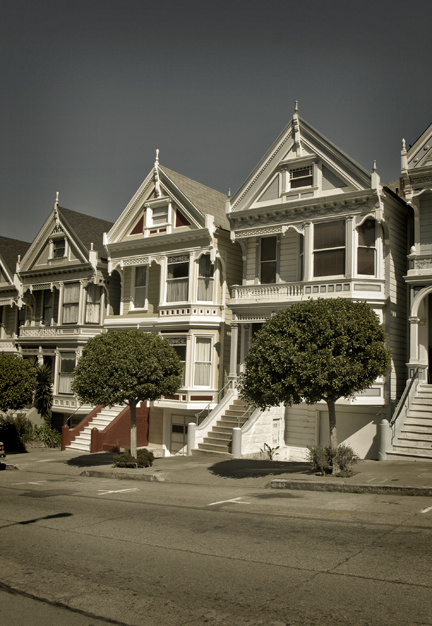 These houses have been used as characters' homes for films and television shows such as 'Invasion of the Body Snatchers', 'The Woman in Red', 'Maxie', Too Close for Comfort', and 'Full House'. Their photogenic appeal comes from the downtown skyline visible behind the homes and the grassy open Alamo Square park in front of the homes. Built from 1892 through 1900 the homes originally were sold for $3,500 each and represent just one of the many and varied styles of Victorian houses throughout San Francisco.